GOLD!! East Nationals for DA Girls 16U Black! The Gold Medal at the 2010 East Nationals was the reward for all the hard practices and training for the Durham Attack Girls 16U Black Team. For day one of the East Nationals the team was well rested and ready to play, resulting in a first place finish in pool play. With Two set wins over Express of Quebec, Interclub of Burlington and Blizzard of Nova Scotia, the girls were starting to get into the spirit. Day two of power pool saw them in a group that included Celtiques Noire, Libellules, who won two years ago and this year’s number 1 Seeded Quebec team, Mousquestaires. Two sets wins against Celtiques and Libellules set up the final match of the day against Mousquestaires. DA was confident going into the match against a team that started smaller players. The Mousquetaires took advantage of our unforced errors and with their motto “Defense” executed their strategy on the court by earning a win in a three set match. Final day 3 matches first saw 16U Black play against a Club that we have the upmost respect of and last years East Nationals Champions, the strong Ottawa Mavericks. Two set wins of 25-17 and 25-20 sent our girls into the semi finals. A talented team form Jean-Eudes of Montreal, who eventually won Bronze, was next for Attack. The girls, who were now hitting their stride, won 25-12, 25-19. The Gold medal match was a rematch again, with the number seeded Quebec team Mousquetaires. The Mousquetaires were undefeated so far this tournament, and Attack’s only loss was against them. But this time the girls were ready, all dressed in all black. A motivational plan that was “hatched” allowed the girls to relax and start the match with a focused, fun attitude that allowed them to play without tension. They played with determination and skill and won the first set 25-16. The second set was important for the girls not to let up and keep pressing for the win. They did not relent, with outstanding offence and great blocks they went ahead 20-12 then 24-15 for an eventual win of 25-18! What a great result for the Gold Medal Winners of the East Nationals!! Congratulations to the Girls, Coaches Kevin, Mike and John. The 16U West Nationals are Next. Girls 16U Black Win Bronze at 17U Provincials!! May 2, 2010 17U Ontario Provincials, DA Girls 16U Black Win Bronze! Playing up in Division 1 of the 17U Girls Ontario Championships, the 16U girls finished the weekend in great style earning the medal. The girls were determined to medal in the 17U Provincials. But again, wins were not going to be easy playing against older and taller teams. Day one had the girls seeded as #7 and playing against other tier 1 teams. The first game was a three set win against Stratford Stingers. The second match was a two set win against Oakville Thunder. The third and final match of the first day was against #2 seed DRVC. Having lost in previous matches against them during the season this time our girls were on fire with enthusiasm winning 25-16 and 25-12 to place first in their pool. Power pool day 2 started the day against the #1 seeded team Forest City 17U. A third set win of 15-5 earned our girls a match win. The 4th seeded team 17U Predators was next with convincing wins of 25-10 and 25-22 to set 16U Black up for the final match of day 2 against Element 17U. The first set was hard fought by both sides with each team taking and giving up the lead until Element finally prevailed 28-30. The second set and match went to Element to give 16U Black second place in the pool. Day three was elimination day towards the medals. Our girls won against Scarborough Falcons 25-22 and 25-15 sending our team to the final four semi finals. Defensa was next. A team that was seeded fifth and was having a great tournament. Defensa earned wins of 23-25 and 16-25 to send our team into the Bronze medal match. The girls played KW Predators 17U for the second time this weekend. Outstanding serves gave DA a lead of 8-0, 14-5 and finally a first set win of 25-13. Set two was close but Predators won 21-25. The tie breaker was as close as it could be with scores of 8-5, 8-8, 13-13, 15-15, 16-16 and finally 18-16 for Attack and Bronze! Playing 9 matches over the weekend and winning all of them except the ones to the Gold (Element) and Silver (Defensa) medal teams was a great result for our girls. It’s on to 16U East and West Nationals where the girls will use this experience to their advantage. Outstanding job Girls and Coaches! 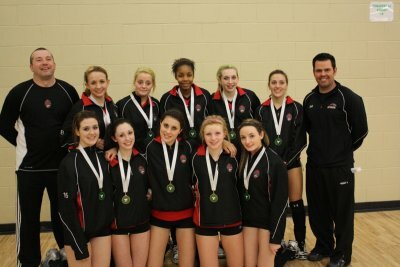 The Girls 16U Black had high expectations coming into the 2010 Provincials as the number 1 seeded team. But knowing that they compete at the highest level and had close matches with the other top tier 1 teams all year long, wins were not going to come easy. DA Attack Black, KW Predators, Ottawa Mavericks, Aurora Storm Thunder, DRVC, Georgetown Impact and Scarborough Titans were the teams that could win on any given day. Days one and two saw the girls win all their matches and finished first in the pools. Day two included wins against DRVC and Scarborough Titans. Day three was single elimination day on the path towards Gold, Silver and Bronze. A quick match win against Georgian Cubs and a tougher win against Halton Hurricane set up a match against Scarborough Titans, who had just won over our sister Red team and Aurora Storm Thunder. The girls had won against the Titans in day two and this was the rematch. Set one saw our girls earn a 26-24 win. The second set saw Titans go ahead 3-12 for a lead that they would not give up and eventually won 18-25. The tie breaker again had the Titans go ahead 3-8. Their strong blocking and great defensive game held on for a 9-15 win against our girls. The Titans went on to win Gold against the Mavericks, who defeated the Predators to earn a spot on the Gold Medal match. DA Girls 16U Black saw the Predators win with scores of 28-30 and 21-25 for the Bronze. In the end, our girls played hard all weekend and although disappointed with the final result, they realize that any of the top teams can win on any given day. The Nationals is the next 16U tournament and we will see which team it will be then. Great job Girls and Coaches and Parents! DA Girls 16U Black Takes on the Beasts! Girls 16U Black participated in the 2nd annual 2010 Beast of the East National Elite Invitational volleyball tournament in Oshawa on March 26-28, 2010. Hosted by the Durham Attack Girls 17U and 18U teams, this high quality event saw twelve 17U and ten 18U Premier Tier 1 teams compete over three days. Our 16U team competed in the 17U waves and not only held their own, but they won 8 out of the 13 sets they played in. Finishing first in pool play, notable wins were against the 16U KW Predators and a two set win against the 17U Bisons of Manitoba. Sunday games saw the team lose a tie breaker against the 17U OVA Provincials 5th seeded team, Defensa 25-13, 22-25, 12-15, then another tie breaker loss to the #2 seed DRVC 25-20, 19-25, 12-15. The girls took the other 17U teams by surprise by playing great disciplined games. They used strong fast offence plays and could have won either game with the right timing and bounce. This was a great final tune up for the girls before they go to the provincials next month. Thanks to the DA 17U and 18U coaches Curtis, Chris, Evan, Ian and the rest of the coaching staff for hosting the Beast of the East. And thanks to Kevin, John and Mike for all your work. DA Girls 16U Black Win Gold at 17U Tournament! March 6, 2010, Durham Attack Girls 16U Black won Gold at the 17U Burgarski Cup, Championship East in Peterborough. It was the final match of the regular season for the team, a season that saw them earn 3 Gold’s, 1 Silver and 2 Bronze medals in the seven 16U/17U OVA tournaments they played in this year. What a great result for the team and coaches who have practiced and trained 3 days a week for the past 6 months. In this tournament the girls won all their matches over the day, except for one set. A close call by a line judge was overruled by the ref in the other teams favour. At the time, Attack was making a come back from 13-21 to get within 21-23 when the call was made. Someone got a Yellow card and the other team got a point. It wasn’t a bad call, just that nobody knows who did it. The regular season has been a fun and rewarding event for the girls, coaches and team. We travelled to a lot of different cities and towns, got to see and meet a lot of other teams, parents and referees and it all came together as a rewarding experience for everyone. It’s on to the Provincials next. DA Girls 16U Black Capture Gold! Feb. 20, 2010 at the 16U Bugarksi Cup UTSC Premier Division, Durham Attack Girls 16U Black won a thriller match to win Gold in a tie breaker against KW Predators. 16u Bugarski Cup Gold Medalists! The day started off a little slow for the girls splitting a match against Scarborough Titans, 25-21, 16-25. The Titans have always given Attack a hard fought match and today was no different. The second match was against Phenix, with wins of 25-17, 25-12. Third match of pool play was with Ottawa Mavericks, again another team with skilled players and great attitude. Attack won both sets 25-17 and 26-24 for a first place finish in the pool. The first crossover match against Forest City Green was a quick match for Attack winning 25-10, 25-11. Another strong team, Aurora Storm Thunder was the next semi final match. Storm has always been one of top teams. This time Attack won 25-20 and 25-12. Storm went on to win the Bronze over the Mavericks. Final match of the day was against KW Predators. This was the rubber match between these two teams, with one Gold each in the 16U Premier Division. Both of these teams are well coached and have very evenly matched players. Both teams played in the US last weekend and learned from playing the Americans. The first set saw Predators take the lead 8-10 then pressed on. Attack was behind 10-17 at one point in the set. Attack fought back to 15-18 only to see Predators press again for a 19-25 win. With their backs against the wall, Attack went ahead in the second set 11-5. Predators caught up 12-12 then went ahead 19-21. It was Attack’s turn to press with outstanding composure and great kills to even the score 22-22, then they went ahead 24-23. The score was tied again at 24-24 when Predators got a point up 25-24. Great defense allowed Attack to tie again 25-25 only to go behind one more time 25-26. From that point on Attack serves and quick passes overcame the Predators with Attack scoring 3 straight points for a 28-26 win. The tie breaker was 8-5 for Attack when the teams changed sides, Attack’s disciplined play and again composure, saw them go on to a 15-6 win and GOLD! It was a great match between two strong teams, who will meet the next time at the Provincials. For Durham Attack Girls 16U Black medaled in all four of their 16U tournaments this season, earning a Silver, Bronze and two Gold’s (in the last two tournaments). Great job Kevin, John and Mike and to the Girl’s Congratulations!! !